Figure 1. Components of the homeostatic system Haemeostasis involves an interaction between the coagulation system, platelets and the vessel wall. Coagulation defects are screened by the prothrombin time, activated partial thromboplastin time and thrombin time. If activation of coagulation is prevented (by blotting blood with a filter paper) and vessels are not allowed to contract by occluding venous flow hemostasis will depend on vessel wall and platelet function. The bleeding time that is based on this principle was proposed as a screening test for defects in homeostatic functions of the vessel wall and platelets. Though bleeding time was described by Milan in 1901, Duke, who described the earlobe test in 1910, demonstrated that the bleeding time was prolonged by thrombocytopenia and corrected by transfusion of whole blood that increased platelet count. Ivy, a surgeon observed that bleeding time by the Duke’s method was normal in many patients with jaundice. He attributed this to variability in the “tone” of capillaries. He modified the bleeding time by applying a standard pressure with a sphygmomanometer cuff proximal to the test wound to counter the interpatinet variability in capillary “tone”. Ivy’s method eventually became the standard method. The bleeding time appeared to be a clinically useful test. One of the greatest concerns of a surgeon is peri-operative bleeding. The purpose of bleeding time was to asses the platelet and vessel wall function and provide the surgeon with safety net. It was shown that the bleeding time correlated with platelet count. The incidence of bleeding in patient with idiopathic thrombocytopaenic purpura is less for the platelet count and patients with uraemia may bleed even with normal counts. Bleeding time was shown to be shorter than expected form platelet count in idiopathic thrombocytopaenic purpura and longer than expected form platelet counts in patients with uremia suggesting that it could mirror in vivo platelet function. The simplicity and the apparent usefulness of bleeding time made it a popular test for screening and diagnosis of bleeding disorders. Bleeding time was never systemically evaluated. Studies evaluating bleeding time began to appear 1984. The characteristics of a test include sensitivity, specificity, positive predictive value and negative predictive value. These have never been determined for bleeding time. Bleeding time failed to predict bleeding leading to discontinuation of the practice of performance of pre-opertive bleeding time. In more damming evidence the discontinuation of bleeding time has not been found to increase the incidence of post-operative bleeding. An important assumption of bleeding time is that skin bleeding time co-relates with tissue bleeding time. No relation has however been found between skin and brain bleeding time in rats. How is Bleeding Time Performed? Bleeding time is performed by the Ivy’s method. The sphygmomanometer cuff is inflated to a presure of 40mm of Hg and maintined at that throughout the test. Using a standardized divice a cut is made on the dorsal aspect of the forarm avoiding scars and veins. The blood is blotted every 30 seconds using a filter paper avioding touching the wound with the filter paper. Bleeding time is the time taken for the bleeding to stop. If bleeding does not stop by 20 minutes the cuff is deflated and haemostasis is achieved by applying pressure. The bleeding time leaves a scar on the forearm and this is an issue in patients with a tendency to form keloids. The bleeding time is often performed by measuring the time taken for bleeding to stop following puncture of fingertip by a hypodermic needle. This not standardized and is inappropriate. Bleeding time has not been found to be useful for screening for bleeding or for the diagnosis of bleeding disorders. Bleeding time is of limited value in von Willebrand’s disease, a common bleeding disorder. Half the patinets with von Willebrand’s disease have a normal bleeding time. Even when prolonged, the bleeding time shows a day to day variability in the same patient. The coefficient of variation of the test is 15%. 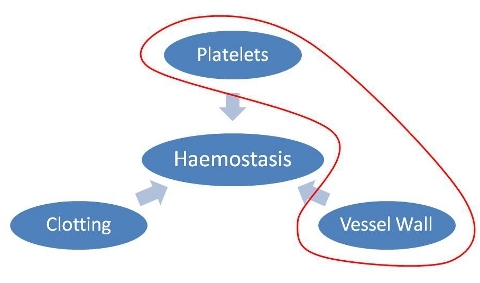 Given the numerous interactions between platelet, vessel wall and the coagulation system, the seperation between the components of haemostasis is artificial. Patients with hemophilia, a coagulation disease, have a prolonged bleeding time and heparin may increase bleeding time. Bleeding time should not be performed to asses haemostasis. The starting point to investigate a bleeding patient is a combination of prothrombin time, activated partial thromboplastin time, thrombin time and platelet count. Platelet count, morphology and function tests should be used to asses platelet function. The concept behind bleeding time is appealing better methods are needed to test the concept.